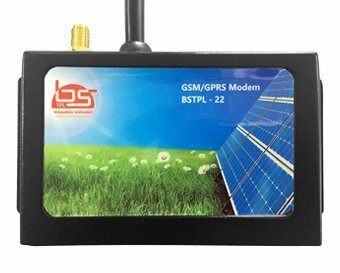 BSTPL-22 GSM / GPRS Intelligent modem is designed for easy integration with external devices / accessories having RS-232 or RS-485 interface. This modem can be interfaced with external devices like Energy Meters, PLC devices, Data Loggers, Fuel Sensors, RF Readers, Generators and Controllers for industrial applications. The modem is also equipped with features like CSD, SMS, GPRS, PC fax and supports TCP/UDP/FTP/HTTP Protocols. BSTPL-22 GSM/GPRS Modem is designed with high level circuit integration to achieve superior performance with minimum space and varied DC power requirements. The modem is designed to withstand toughest field environments, making it an ideal solution for Remote Data Transfer, Industrial Automation, SCADA, Industrial and outdoor applications. BSTPL-22 GSM/GPRS Intelligent Modem uses most advanced 32-Bit Cortex M3 Microcontroller for superior operation in toughest conditions supported by highly sensitive Quad-Band GSM/GPRS modem. Equipped with high gain external GSM antennas, BSTPL-22 provide accurate real-time data to customer without any data loss. Supporting wide operating voltage (DC 6V to 40V), BSTPL-22 has provision for RS-232 and RS-485 Communication Ports. Also has optional Digital Inputs, Analog Inputs, Digital Outputs and CAN port for interfacing to various external products, accessories, sensors and equipment’s which need to be continuously monitored and controlled. BSTPL-22 enables the user to monitor and control various 3rd party accessories / devices installed at remote areas from a central location without any manual intervention and assistance. The device improves overall productivity with better accuracy, control, safety and security which in turn offer better returns to customer on the investments. Intelligent modem is suitable for application like SCADA, Industrial, Process Automation, Agriculture, Security systems and other application where remote data logging and controlling required. BSTPL-22 can be customised as per the requirement of customers with different communication protocols. BS Technotronics Private Limited (BSTPL), founded in the year 2012 with a dedicated team of Engineers having wide expertise. 8-15-106/1, Plot No. 8, 1st Floor, Adjacent Lane to Vijayalaxmi Theatre, L.B. Nagar, Hyderabad - 500074, Telangana, India. BS Technotronics Private Limited © .